I know of several Christians who have doubts as to whether they’re saved or not. What’s going on with these believers? Imagine trying to witness to someone about Christ by saying, “You can be saved….but, they’ve got to hold on. If you’re not careful, you can lose it, but you can go to heaven and have eternal life, but if you….” When Jesus gives those who trust in Him eternal life, it’s a done deal. If someone loses their “eternal life” then they either never had it or didn’t even know they had it in the first place. Jesus came to give us eternal life, and if you lose it, it was never eternal, but Jesus as God cannot lie. He says, “All that the Father gives me will come to me, and whoever comes to me I will never cast out” (John 6:37), but to give even more credence to Jesus’ words, He adds it’s also the Father’s will, saying “And this is the will of him who sent me, that I should lose nothing of all that he has given me, but raise it up on the last day” (John 6:39). It is Jesus’ will and the Father’s will that not even one is lost. What kind of a shepherd would go out with 100 sheep and come back with only 99. Most of us would say, “Hey, that’s 99%” but Jesus brings home all His sheep, and even death can’t separate them from God (Rom 8:38-39). It’s really not the perseverance of the saints but the preservation of the saints by God! The saints persevere only because of God’s empowering them to do so by His Spirit. Sanctification or a growing in holiness will be ongoing throughout life, but the justification is immediate. Jesus is both the Just and Justifier (Rom 3:26)! I don’t know who is and who isn’t saved. I may think I know, but God alone knows the heart (1st Sam 16:7), but I do know when I hear someone hesitating or procrastinating before they believe in Christ. Many are waiting until they “clean up their life,” but this is a tragic mistake, because dead men and women can’t do anything (Eph 2:1). A corpse cannot give itself a bath! If this were so, Jesus would come to a four-days-dead Lazarus, and say, “Lazarus, I’m going to resurrect you, but you‘ve got to overcome some things….namely, cleaning yourself up. You’re a mess!” Of course, Lazarus couldn’t even blink an eye to contribute to what Jesus did by raising him from the dead. 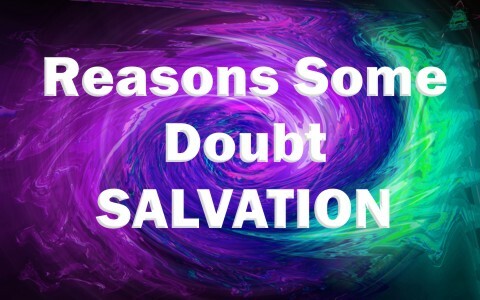 That’s because salvation is fully a work of God. God even brings us to repentance and must change their (and our) hearts (2nd Tim 2:25; Acts 8:22). When we doubt our salvation, it’s the same as doubting God’s ability to save us and trusting more in our ability to “hold on” or clean ourselves up. Christians who are living in sin often forfeit their assurance. The Holy Spirit is grieved when we sin and serious convictions begin to assail our conscience, and that’s actually good, because when the conviction from sinning stops, that means the Spirit’s been resisted, grieved, and quenched so much that the person can’t even sense the Spirit anymore, and that’s a very dangerous place to be. Some lived in this way and God brought them home early in the Corinthian church. If God sees a believer doing more harm than good for the cause of Christ, then He has every right to bring home believers (and I am convinced that He sometimes does). That doesn’t mean everyone who dies young is living in sin. Again, only God knows the ultimate reasons and that means it’s none of our business. Harboring a grudge is living in a state of un-forgiveness, and a person who lives that way doesn’t recognize the infinitely greater offenses that our sins have come before God. Jesus died for us while we were still ungodly, wicked sinners who were His natural enemies (Rom 5:6-10), and we can’t forgive our spouse or friend or co-worker or….? Our prayers are certainly hindered when holding a grudge and this can cause us to lose our assurance in Christ. We know He is not pleased at our unforgiving nature and that probably troubles the mind quite often. If they would only understand the Parable of the Unforgiving Servant (Matt 18:21-35), they might have the funeral and bury that grudge. One person I was counseling who believed they’d lost their salvation didn’t know enough of the Scriptures to know that God never fails at what He has willed to come to pass, and those promises are found in Scripture. Frequently, their Bible reading time is little or nothing at all, so it’s no wonder they have doubts and many times they aren’t assembling together as the Body is commanded to do (Heb 10:24-25) so they don’t grow by failing to sit under good Bible teaching and preaching. Far too many Christians are living in fear and doubt over their salvation, and are worried about going to hell. Such people may not even know about Ephesians 1, Romans 8, John 6, 10, and 11, and many, many other Scriptures like them. These promises of God are as sure as God Himself Is. My response to them is not what I think but what God’s Word says, and His promises are not conditioned on whether we pass or fail or what they feel, but upon God’s own reputation, and what God has determined from time past to be, cannot be altered by any man or woman, nor any demon or catastrophe. If God has spoken and it is yet in the future, it’s as good as done already. It’s as if we’re already seated in the heavenly, because we are (Eph 2:6)! There are certainly many other reasons people live in doubt and fear, and that’s sad, because it robs their joy. We ought to be the joyous people on the planet, but sometimes we look like Eeyore from Winnie the Pooh. It is so easy to have our feelings rule our life but my experience is that feelings are way too overrated. We put feelings over facts. When God brings someone to repentance and faith in Christ, we have to trust Him and take Him at His Word. Whatever we feel doesn’t change what is true (John 3:16-17). What you and I feel doesn’t make something true or false. Human feelings are the shallowest, most undependable of all sources, but God’s Word is true and never changes, even if heaven and earth should pass away (Luke 21:33). Previous post: Are Quenching and Grieving the Spirit the Same? Next post: In What Specific Ways Does God Chastise His Children?